An annual, the corn plant (Zea mays) has a relatively short life cycle of only 120 to 150 days. During its lifespan the plant will grow between 3 to 10 feet tall, depending on the variety. A strong root system supports the plant even in windy weather conditions. The tiny corn kernel is the seed of the corn plant. Within its depths the kernel holds the embryonic life of the plant and a wealth of nutrients to aid in its growth. Kernels vary in color from yellow, red, orange, black and bronze. For germination to begin the corn kernel must contain at least 30 percent water, according to the North Dakota State University. Plant each kernel 2 inches below the soil line. The corn kernel sprouts roots first, followed by its shoot. The root system will grow up to 7 feet deep and spread 2 feet out into the soil during the plant's short life cycle. The roots are fine in appearance, which enables them to traverse through the soil. Directly below the soil's surface, the plant forms root nodules. Roots grow upward from the nodules to the base of the plant above the soil line to anchor the tall corn plant in place, according to Oregon State University. Besides holding the plant in place, the brace roots also absorb nutrients and water. During the corn plant's life it will develop a large stalk with 20 to 21 leaves, according to the Iowa State University. Silk production begins when the corn plant reaches around 65 days old. The top tassels form first. Pollen falls from the tassels downward to the silk of the plant to produce kernels. Insects, birds and the wind also aid in pollination. The tassels contain the female reproductive organs and the flowers of the corn stalk contain the males. Pollen is shed for up to eight days to ensure fertilization occurs. Most corn plants will produce one to two ears per plant. The very tips of the corn ears will stick out past the silk. Once they begin to protrude outward it indicates that the corn is ready for harvest. The silk surrounding the corn ear also begins to turn from golden to brown. Large-scale commercial corn farmers use combines to harvest corn. The backyard gardener simply tears the corn from the plant using their hands, pulling the ear downwards. Pick the corn at the height of ripeness for maximum sweet flavoring. The end of the ear will feel rounded to the touch instead of pointy when the corn is ready for harvest. Promptly refrigerate picked corn to ensure its flavor remains at its peak until it can be consumed. 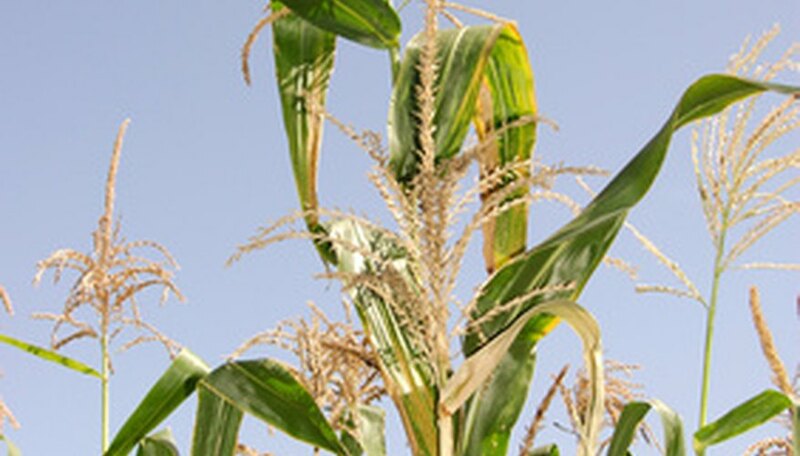 Once the corn ears are harvested, the plant begins to dry up and die. It has completed its life cycle.